Gerber was born in Windhoek, Namibia, in 1966, where she was to spend the formative years of her youth. It was during these years that her interest in art developed. Namibia is renowned for its landscape and wildlife and these were to have a lasting influence on Gerber who wanted to capture the sights she saw on paper. However, her family moved to Kempton Park outside Johannesburg when she was eleven years old. After matriculating at the local high school, Gerber completed a national diploma in graphic design at the Pretoria Technikon. 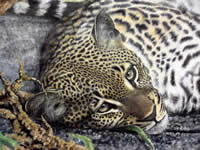 At this time she began to use ink as her preferred medium for capturing wildlife. Her first job was with the Atlas Aircraft Corporation of SA as a graphic designer. It was here she meets her husband whom she married in 1989 and together they have children Theo, Marinette and Pierre. 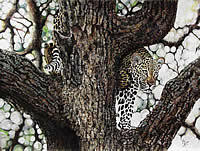 In 2002 Gerber began to work on her wildlife art again. Her work is noted for its high quality and keen attention to accurate detail.